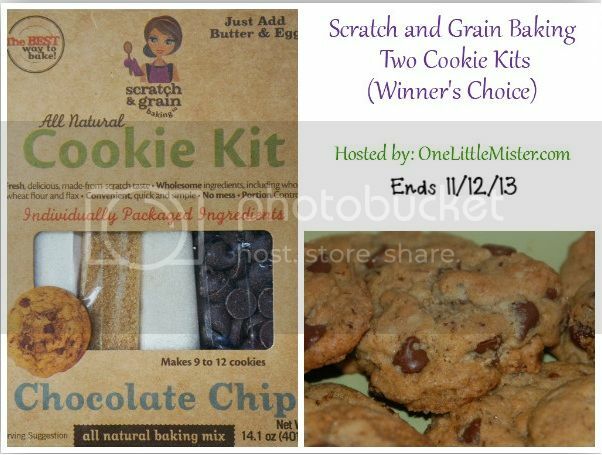 Read the full review of Scratch and Grain Baking Kits at OneLittleMister.com. Kits can be purchased individually or in 4 packs from ScratchandGrain.com. One lucky reader will win TWO free kits of their choice! Open to US only and ends November 12, 2013. Disclaimer: One Little Mister and all participating event bloggers are not responsible for prize fulfillment. I'd love to get the Gluten Free Chocolate Truffle and the Chocolate Chip cookie mixes! Thanks for the great giveaway! I would pick chocolate chip and oatmeal raisin. I think the Holiday Sugar Cookies and Snickerdoodle... I've never had Snickerdoodle cookies but they look good! I'd pick chocolate chip and oatmeal raisin. GF Truffle and chocolate chip!